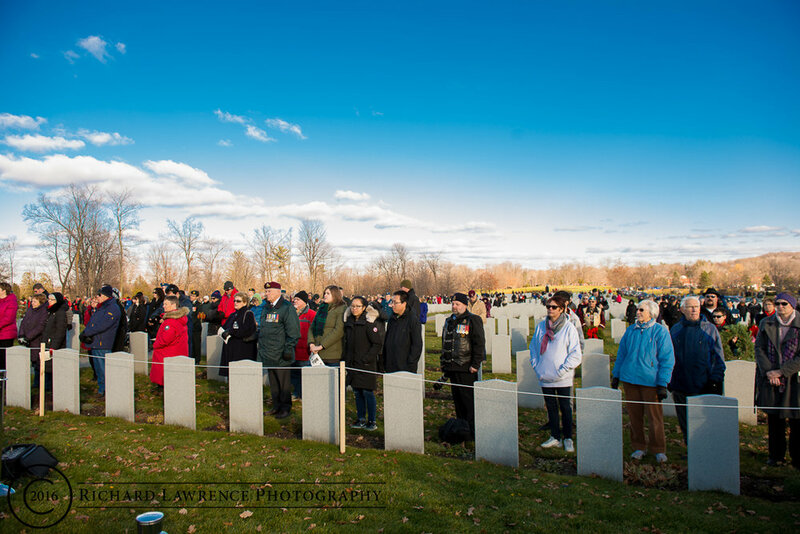 On Sunday, December 4, Wreaths Across Canada held its sixth annual wreath-laying ceremony at Beechwood National Cemetery. 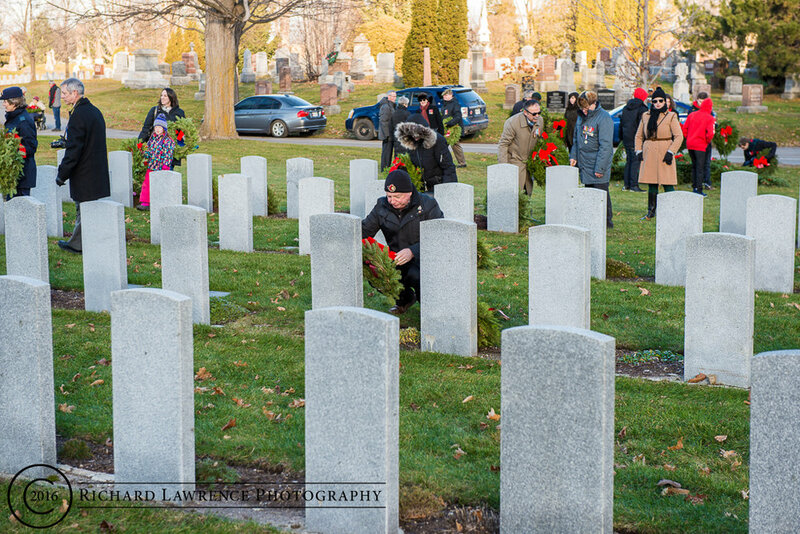 Wreaths Across Canada (WAC) is a non-profit organization dedicated to honouring and remembering all the men and women of the Canadian Armed Forces for their service to preserving freedom and democracy in Canada and worldwide by placing balsam wreaths at their headstones. This ceremony is carried out on the first Sunday of December, at a time of year when families typically begin to gather. It was a coolish day and very bright, without a hint of the snow that was to fall overnight. Hundreds attended the ceremony; some to watch, some to lay personal wreaths, and some to participate as volunteers for WAC in laying the wreaths at the headstones of over 1,000 passed servicemen/women. Across Canada, more than 3,500 wreaths were laid in remembrance. The poem “Honour” was read by Kathleen Mills and speeches were given by WAC, Grete Hale (representing Beechwood Cemetery), and MGen. Wayne Eyre, Deputy Commander of Military Personnel Command, who also laid the wreath at the monument at the National Military Cemetery location. Cadets in attendance then marched off to start laying the wreaths in both the old and new military sections of the cemetery along with diplomatic representatives. Shortly after, the public was invited to participate by taking wreaths from strategically located piles and placing them by military headstones. Of particular note to me was the meeting at the end of the day of a lady (CW for privacy) who was wearing a Memorial Cross (a.k.a. Silver Cross). CW had lost her husband in 2010 and had returned after the hubbub of the ceremony to spend a couple of quiet moments with her husband and Eva, an 18-month-old golden retriever who was about to return to Guide Dogs for the Blind for training. In truth, I wouldn’t follow Eva out of curiosity as she still had a lot of puppy in her and seemed to like nothing better than rolling around in the grass and playing. Notwithstanding the solemnity of the day, CW was gracious enough to speak to me, share her story, and allow me to take a picture of them. Photos by Richard Lawrence Photography, compliments of Beechwood Cemetery.